The Imperium of Man is so large, it is said, that to try and understand its war-torn network of planet-states and tributaries is to invite madness. It’s a nightmare for the bureaucrats of the Adeptus Administratum, and a headache for game designers attempting to do the 40K universe justice. 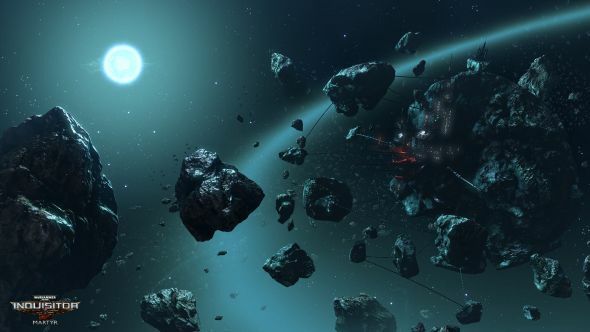 While away the summer in the nice, cold vacuum offered up by the best space games. 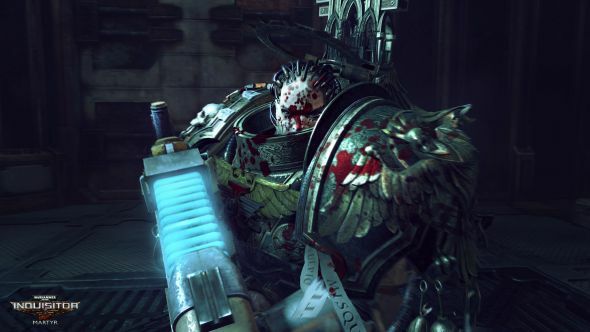 Sensibly, Warhammer 40,000: Inquisitor – Martyr developers NeocoreGames have bitten off just a single sector – a secluded region of human-held space made up of mere hundreds of star systems. The Caligari Sector is host to the mini-campaigns and randomly-generated, destructible maps that make up their ambitious action-RPG. 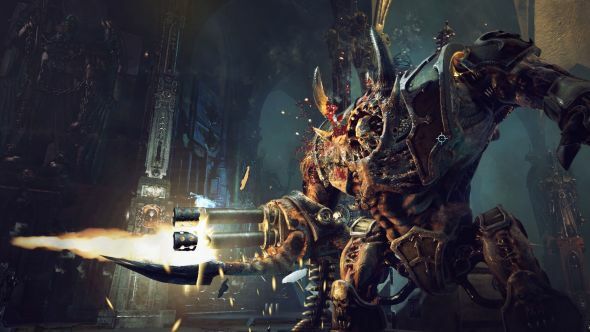 Here’s a thing: there has never been a proper action-RPG in the Warhammer world. Not in the ‘90s, after Diablo; not in the recent post-THQ glut of Games Workshop-licensed games. 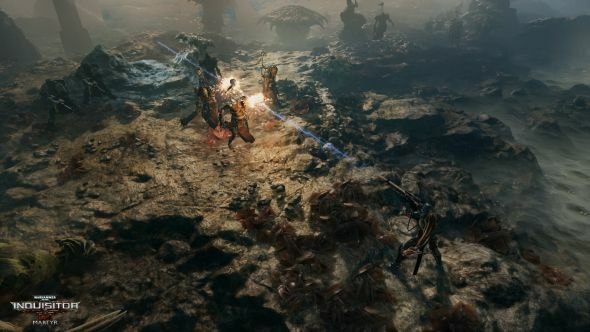 Inquisitor is the first – and it’s a burden Neocore take quite seriously, after dedicating their last few years to resurrecting the isometric best of the genre with The Incredible Adventures of Van Helsing. Gone are the genre-standard waves of beasties, replaced by smaller groups of enemies with the ability to outflank and take cover. And even that cover represents a break from the action-RPG norm – particularly the way Neocore have implemented it. Working in their ownCortech 4 engine, the studio have produced levels made up of multi-layered, malleable terrain. Kinetic weapons will chip away at pillars and pipes, filling the air with dust and rubble. Energy weapons can vaporise chunks of wall, leaving glowing wounds in their wake. Shootouts will leave the battlefields of the Caligari Sector irreparably changed. You’ll want to step behind something thick, and try to take chunks out of the enemy instead. Most can be “literally cut into pieces”, giving rise to some gory tactical considerations. Target an explosive tank on the back of a Chaos heretic and they’ll be bathed in purifying flame; knock a limb off a bulbous boss demon and that pesky appendage won’t be bothering you again. Neocore plan to recreate “each and every creature that has a place in the 40K universe”, and find horrible homes for them all. Hive cities, battleships, fortress monasteries and the diseased surfaces of planets infected by the Chaos god Nurgle – all will feature in maps assembled from a pool of pre-generated parts. For those wary of too much randomness – though there’s nothing more 40K than the roll of the dice – there’s also a “very traditional” single-player campaign embedded in the Caligari starmap, replete with cutscenes, NPCs and the like. Further progression comes in the form of Grand Investigations – missions that end in clues for follow-up objectives. Membership in the Imperium’s secret police certainly comes with its perks. You’ll have your own Inquisitorial fortress – a customisable, upgradable hideout that becomes the focal point of PvP. In a mode that recalls the castle-bashing of Ubisoft’s Mighty Quest for Epic Loot, you can invade others’ fortresses, dealing with their defence systems and fanatical followers in return for loot rewards. It may yet be said, in the grim darkness of 2017, that to try and understand Warhammer: Inquisitor in its entirety is to invite madness.